Try and get your head around this article I found at Trove. 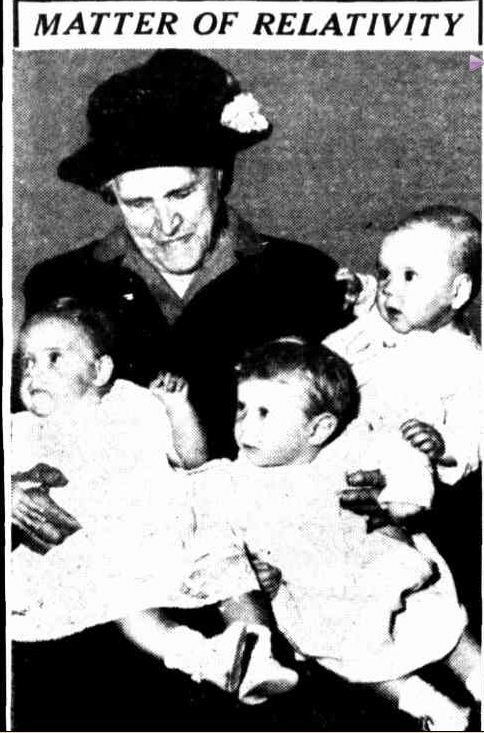 It appeared in The West Australian and the Adelaide Advertiser in December 1951. I am almost certain this is my first cousin 4 x removed, Amelia Harman, daughter of Jonathan Harman. Amelia married Christopher (Chris) Bell of Heywood in 1901. They had three children, Millicent Irene (born 1901), Clarence Jonathan (1902) and Christopher George (born 1903) all born at Heywood. Clarence died in 1905. If it is Amelia, at least one of the girls is a descendant of Christopher George Bell. At the time of the photo, Christopher was working as a senior constable of police at Casterton. He would have been around 48 at that time so I’m guessing Cheryl of Casterton is Christopher’s daughter. Amelia had an older daughter Elsie May who married Herbert Skipworth at Heywood in 1909. Therefore, Helen Skipworth is likely to be a descendant of Elsie and Herbert. Which leaves Lynette Wilmot who also would likely be a descendant of Elsie May and Herbert. Another amazing thing is the three girls are all nine months old! Cheryl, Helen and Lynette would be 61 now. If they or any other Bell family members see this, I would love to confirm if this is Amelia Harman and the various family relationships. Amelia was around 87 at the time of this photo. She passed away in 1957 aged 91. This entry was posted in Harman, Trove Tuesday and tagged Bell, Casterton, Harman, Heywood. Bookmark the permalink. Wow! good luck sorting that one out Merron. What a wonderful article to have though. How wonderfully confusing & marvellously interesting! I’m still trying to wrap my head around this! Too confusing for me I’m afraid. I hope younger a hit with your search Merron.